So considering that the oldest copies of the gospels are dated to around 400 AD (I'm thinking of the Codex Sinaiticus), how do scholars go about estimating the date of composition of the gospels? I mean I'm sure there are some textual clues; I mean I assume the usage of Koine would probably change somewhat over 300+ years but are there other clues that scholars use to estimate the general time of composition? 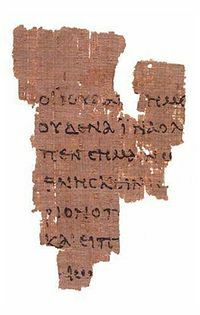 Dating the papyrus scrap is difficult, but based on the style of the script used, it's probably between 117 CE and 138 CE. (Slightly larger ranges are more-likely to include the actual date, but also begin to lose accuracy. Circa 125 CE is the standard single-point estimate.) Because the codex P52 came from was written in Alexandria and the gospel originated elsewhere, the gospel of John must go back to the 1st century. If we can date John to the 1st century, we can have some confidence that the other gospels are at least as old. For one thing, there's evidence that the author of John was aware of the synoptic gospels. In addition, many scholars believe that Luke and Matthew had Mark available when they wrote their biographies of Jesus. They additionally might have had access to an even earlier source. For our purposes, the exact solution to the synoptic problem doesn't matter; what does matter is that the gospels where not written at the same time. So in the ~92 years between Jesus' life and P52 we need to fit in this sequence of development. There's certainly plenty of leeway here. Mark (t2) has been dated as late as 80 CE, which would bunch all the gospels to the end of the 1st and beginning of the 2nd century. On the other hand, the dates could be clustered nearer to the middle of the 1st century without straining the timeline or credibility. Finally, there is the critical question of how the gospels relate to the destruction of the Temple in Jerusalem. Internal evidence strongly suggests that Mark was written either while the Roman legions were moving toward the siege of Jerusalem or shortly afterward. It could very well be that the Great Revolt was a motivation for the composition of Mark as the Jerusalem church and its eyewitness tradition would have been in peril. If so, all gospels dependent on Mark (i.e., the other Synoptics) must originate from the decades following 70 CE. Since Paul's undisputed letters can all be dated from 50 to 60 CE, the picture that emerges is a nearly continual stream of Christian writing from two decades after the crucifixion to today. Much of the New Testament seems to have been written in response to particular problems the nascent religion actually faced. Unfortunately, Koine Greek, the trade language that the New Testament was written in, seems not to be useful for dating the text of the Gospels. Some have speculated that Matthew was originally an Aramaic text, but since the earliest manuscripts of Matthew are in Greek, that remains a speculation. If it could be shown that Matthew was originally written in the language Jesus likely spoke, we could date that gospel much earlier. As it is, the linguistic evidence is minimally useful, at best, when it comes to dating the New Testament. As a preterist, I believe the entire canon was completed before the destruction of the Temple. Throughout the Old Testament, beginning with Noah's ark, the new house, the new Covenant "shelter," is always constructed before the destruction of the old. In fact, it is persecution from the old that generally tempers and humbles and proves the new. We see this is the houses of Saul and David, Herod and Christ. So the Firstfruits church (AD30-70) was a different entity to what followed, as different as firstfruits is from harvest. It was a result of the opening of the New Covenant scroll in heaven (AD30 - Rev. 4-5) and culminating in the little scroll of John, the final judgments against the Old Covenant order before its destruction. Judgment begins at the house of God. Interestingly, the pattern of the Torah (Moses) being completed before the conquest of Canaan supports this idea. The entire Canon was completed by Greater Moses before a New Israel set out to conquer not the Land but the World. If the Revelation was written prior to AD70, then the later epistles (final warnings to Jewish Christians) were written around the same time or earlier, especially Hebrews, which serves as a kind of New Covenant Deuteronomy. Before this, we have the epistles to Gentile cities, with many dealings with Judaizing doctrine and Judaistic false teachers (the first gnostics). It seems to me the synoptic gospels themselves were composed quite early. As my favourite theologian James Jordan observes, Judaism was not strictly an oral culture. When any great Covenantal event happened, their first response would be, "Where's the book?" Eugen Rosenstock-Huessy has some interesting observations in his book "Fruit of Lips." I have some comments on it here. My main point of course is that we are not limited to mere documentary evidence, either internal or external, in dating the gospels. Being the "fourth testament" (with a break of hundreds of years between each deposit of Scripture), we can see that God works in consistent ways. This ties the New Testament books to historical events as a liturgical, even sacrificial process, recapitulating the same thing found many times over in Israel's history. Familiarity with that makes dating the gospels a lot easier. Not the answer you're looking for? Browse other questions tagged gospels or ask your own question. What language did Jesus commonly speak? Did John know about the Synoptics? What is the evidence for the existence of the Q document? Can we date Mark without first committing to an interpretation of the Olivet Discourse? Existing beliefs or contents of the text more formative in hermeneutics? How did the gospels get their names? Are there any Biblical scholars/textual critics who think the Gospels originally are in Greek? In the Gospels, How Should the Hours of the Day be Understood? Jesus as Adam in the Gospels? What is the Aramaic phrase that is translated “Truly I say to you” or “Amen lego humin” in the gospels? How can we trust the Gospels if nobody was there to witness?